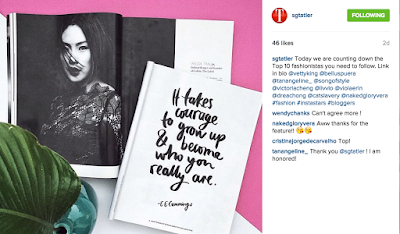 Thanks for including my instagram, Tatler! See the article link here. If you are bored of having your instagram feed filled with the same kind of pictures, let us guide you through the top 10 rising fashion stars, right here on your very own shores. From TV hosts to budding fashion design stars, we have rounded up the top 10 Singapore based fashion stars, sure to brighten up your instagram feed in a flash.